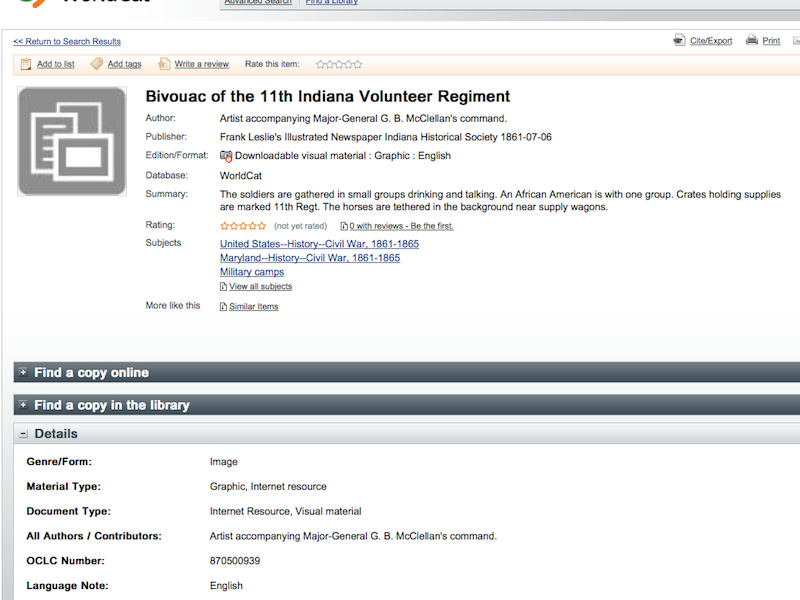 From December 2013 through March 2014, I was an intern at OCLC working with CONTENTdm and the WorldCat Digital Collection Gateway. This internship was completed as a directed fieldwork experience with the University of Washington iSchool. Through this internship, I gained firsthand experience with library metadata, digital collection systems, and user interface and user experience evaluation. 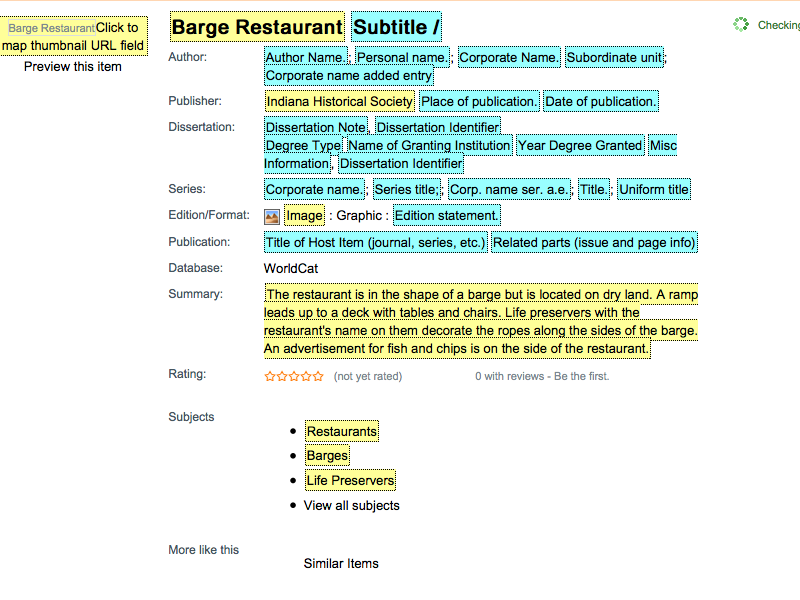 The sections below describe the work I did during this internship, including: learning to use CONTENTdm and the WorldCat Digital Collection Gateway, researching OAI-PMH base URLs for use in harvesting metadata to WorldCat, harvesting metadata from active CONTENTdm digital collections so that they would be searchable using WorldCat, developing a user FAQ document addressing basic functionality of the Digital Collection Gateway, and providing feedback on the Gateway user interface to assist with future upgrades and changes. 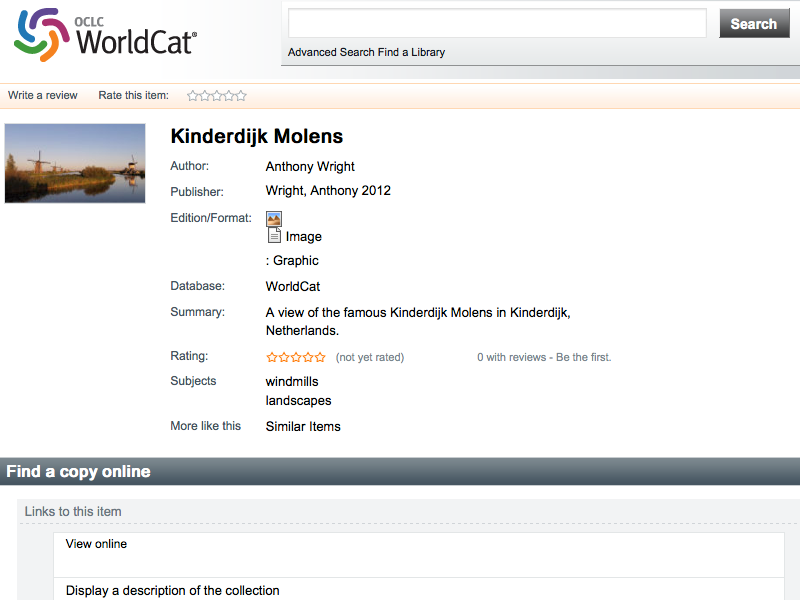 The beginning of my internship involved learning how to use CONTENTdm and the WorldCat Digital Collection Gateway. In order to learn about these systems and familiarize myself with their functionality, I created a training collection and prepared it for harvest into WorldCat. Using OCLC's CONTENTdm software, I assembled a small digital collection based on the Dublin Core metadata element set. Working in CONTENTdm, I built my collection using a variety of images. After my initial work, I added two compound objects (items containing multiple works or pages) so that I would understand how these work within the system. Starting from the default Dublin Core metadata element set, I added and removed fields to suit my collection. I approached this by designing an element set suitable for my collection and removing any elements that I did not need. This served the dual purposes of making the list of elements smaller and easier to work with, and preventing entry of data into elements I did not wish to use. I also used the CONTENTdm administration tool to specify authority control sources for certain elements. For this collection, I chose to use the Art and Architecture Thesaurus for my subject authority control and the Getty Thesaurus of Geographic Names for the location data. 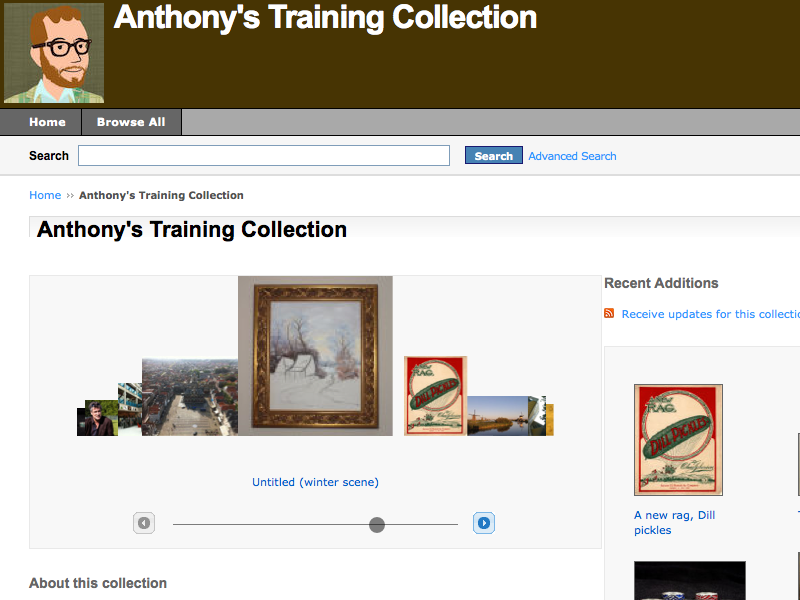 After developing the metadata for the items in my collection, I used the administration tools to customize the display settings for the collection. I customized the header, added a short description of the collection, enabled the image carousel, and defined a suggested search topic as a means of collocating separate items together (I later put the same items into a compound object so that I could see the differences in the two approaches). Working with the CONTENTdm administration tool was a great learning experience. It allowed me to work with Dublin Core to develop a metadata set for my collection, explore how CONTENTdm handles outside authority control, prepare the collection to go live, and see my finished work made available on the Internet. I was able to familiarize myself with CONTENTdm's operation and feel confident that I could easily create more collections in CONTENTdm or help others to create collections. After creating my collection in CONTENTdm, I then worked in the WorldCat Digital Collection Gateway and prepared the collection to be synced with WorldCat. Since this collection was a training collection, it was not actually synced with WorldCat, but all of the steps up to the actual sync were conducted. In the Digital Collection Gateway, I assigned the collection to myself and reviewed the collection profile to ensure that the sync settings were as desired. I then edited the metadata map to ensure that all of my Dublin Core elements were mapping to the fields I wanted and would display correctly. Working with the metadata map, I explored mapping and unmapping elements from specific fields, applying prefixes and field splitting rules, and specifying the edition/format of the items in the collection. Working on the metadata map for my collection allowed me to see how a collection administrator can adjust their collection metadata as desired to ensure it displays correctly in WorldCat. I was also able to use this time to explore the Digital Collection Gateway with familiar metadata as a means of identifying questions to be included in a user FAQ document. Before beginning my metadata harvests of CONTENTdm collections, I worked with another intern, Julie Gaida, to identify the information necessary to harvest metadata from non-CONTENTdm collections following the Open Access Initiative Protocol for Metadata Harvesting (OAI-PMH). Starting from a list of 188 open access collections, we worked to identify the base URL for each collection so that their records could be harvested and made searchable in WorldCat. The majority of the collections on this list were digital repositories at academic institutions. Many of them were hosted using Digital Commons by Bepress but other formats were present as well. Identifying the base URL for each collection was an interesting challenge. The URLs are not the same as the public URL for the collection and they are not often published anywhere on the site. There are directories for open access repositories including OpenDOAR but not all of the URLs appear in those directories. The URLs also do not follow a consistent format. Of the 188 repositories on the list, I worked to identify 99 and successfully found the base URLs for 75 before moving on to harvesting from CONTENTdm collections. The document included here is a copy of the base URL research I completed. 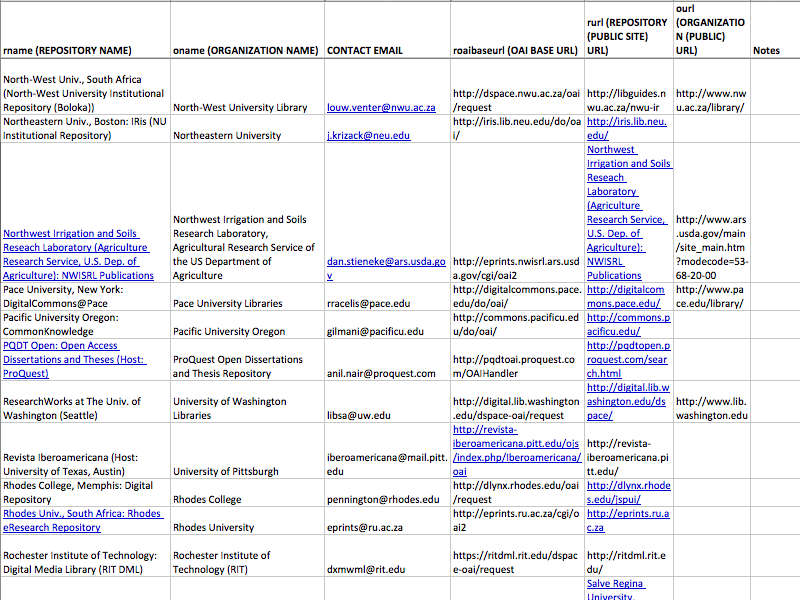 It lists the 75 repositories I found the URLs for and the information I found through my research. One of my main projects was harvesting metadata from active CONTENTdm digital collections. I harvested a total of 40,641 records in 60 collections at the Indiana Historical Society and the Evansville Vanderburgh Public Library. This process was done using the WorldCat Digital Collection Gateway and was performed as a service for existing CONTENTdm customers that had not yet made their content searchable in WorldCat. To begin the process, the customers were contacted by OCLC to inquire about their preferences regarding the user account that should be associated with the Gateway, the OCLC symbol to use for the collections in WorldCat, and to let them know that the harvest would take place. Once the customer's preferences had been gathered, temporary user credentials were given to me so that I could initiate the harvest on behalf of the customer. The process of harvesting records using the Gateway was fairly simple. The collection metadata already existed in CONTENTdm. My work with the Gateway involved reviewing how that metadata translated from CONTENTdm into a WorldCat record to ensure the cleanest record possible using the existing metadata. If the collection title gave a clear indication of what types of records existed within the collection, I was sometimes able to apply a map from a similar collection before reviewing the map to ensure that it was optimized for the specific collection. Using the gateway tools, I applied small formatting rules such as splitting subject fields using a delimiter and specifying the format (e.g. image, map, book, etc.). I also reviewed unmapped fields to determine whether any existing metadata belonged in those fields. These small changes helped to make the record clean and usable in WorldCat while preserving the existing metadata. Once I finished reviewing how the metadata would be crosswalked from CONTENTdm to WorldCat, I initiated a sync with WorldCat. 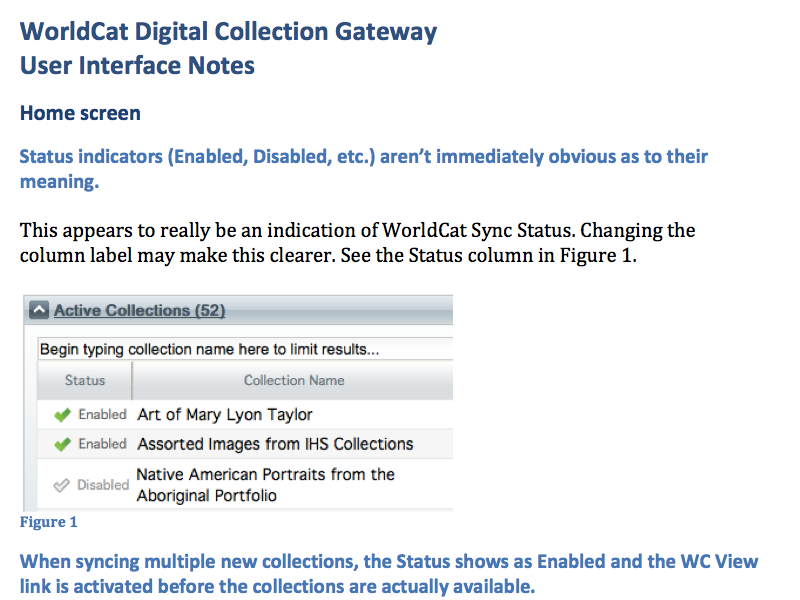 When the sync completed, I reviewed the resulting records in WorldCat to ensure that they were searchable and linked back to the original digital collection. Each record harvested was assigned an OCLC number that was later synced back to the CONTENTdm collection and is available for display in the original digital collection. My experience working with these metadata harvests was enjoyable and educational. 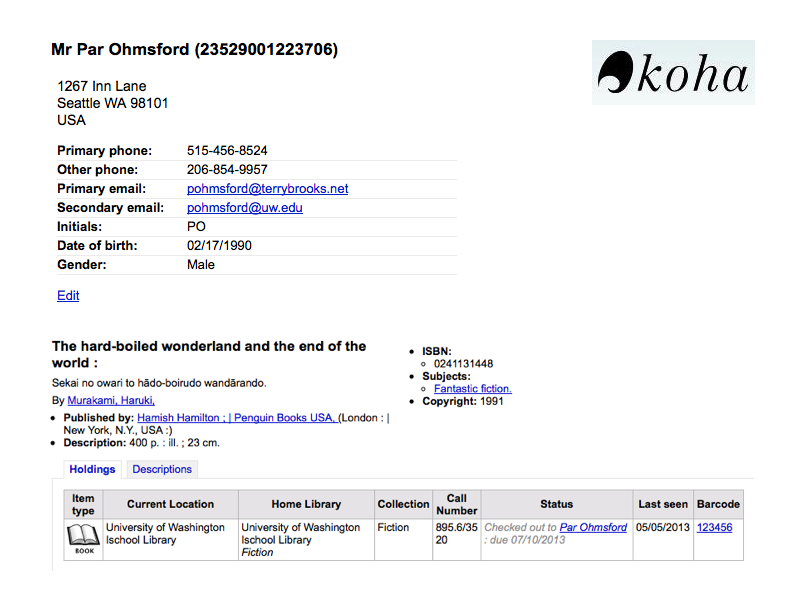 This was my first chance to work with library metadata in the real world. The variety of resources represented by the data and the different applications of metadata by the two institutions allowed me to see how digital resources can be represented for access by users. I also had the chance to experience the process of crosswalking data from one system to another using Dublin Core elements and a MARC21 metadata mapping. To see the records that resulted from my harvests, click on the buttons below. Each button will activate a WorldCat search limited to only the records from the digital collections I harvested. 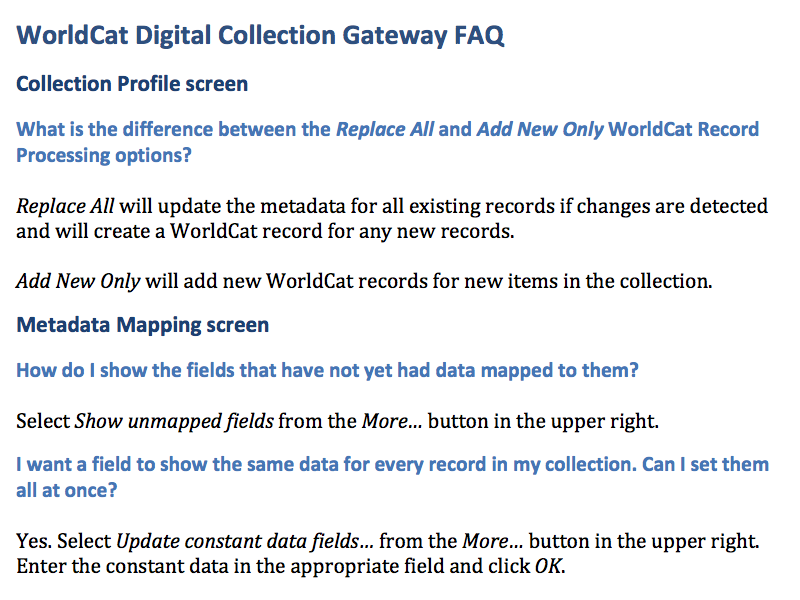 While working with the WorldCat Digital Collection Gateway, I was asked to compile a list of questions about how the Gateway works and notes on odd behavior or confusing user interface features. The list of questions was compiled as a help document for possible inclusion within the Gateway tool and to help future interns quickly familiarize themselves with the tool. The user interface notes were collected to assist with future systems upgrades. To develop the list of questions, I noted any questions that arose while I was working with the Gateway whether I was easily able to find the answer or not. I also asked my fellow intern, Julie Gaida, to send me any questions she encountered. After developing an initial list of questions and answers, I arranged them into a frequently asked questions (FAQ) format. My rough draft was reviewed by more expert users to ensure that the answers I had developed were correct and then I finalized the document. The user interface notes were developed in conjunction with the FAQ. These notes were compiled as a list of suggestions for changes to the user interface designed to improve the user experience. Once an initial list of confusing interface elements was collected, I organized the notes by screen, added my feedback, and inserted screenshots to show the relevant area of the interface. Developing these documents was challenging for me. I am able to quickly learn new software and often speed through questions or odd interface behavior that would trip up other users. My work on these documents required me to slow down and consider what questions or interface elements might be challenging to other users in addition to ones that proved challenging for me. While I was not expecting to work on these types of documents when I started my internship, I learned a lot about evaluating systems with an eye toward improving the user experience. One of the best classes I've taken was Library Technology Systems. This class allowed me to explore the various systems used by libraries to deliver content to users. For this class, I role played being a systems librarian at Rod Library at the University of Northern Iowa. Using freely available information that I gathered through examination of the library's website and other resources on the Internet, I examined and evaluated the systems in use at Rod Library and made recommendations for changes based on my analysis. One of the first projects for this course was a complete systems tour of Rod Library. Based on my research into the systems being used at the library, I recorded a short presentation describing the systems in use. In preparing for the presentation, I familiarized myself with the Rod Library website and the library's organizational structure. I researched the various technologies being used in different parts of the library website and learned about what they do. I then recorded a presentation describing where each technology was being used by the library. This project was a great introduction into the world of library systems. It allowed me to see the variety of systems in use in a modern academic library and how they interact (or don't) with each other. This is one of the first activities a new systems librarian needs to do: an inventory of the systems in use by the library. Knowing what is in use and how it works is a requirement before any changes or improvements can be made. This project has given me the ability to review the systems in use by a library. Continuing the role play in the library systems course, we were asked to evaluate systems for mobile library services and discovery layer services. The result of these analyses involved the creation of memos taking the form of recommendations to library management. 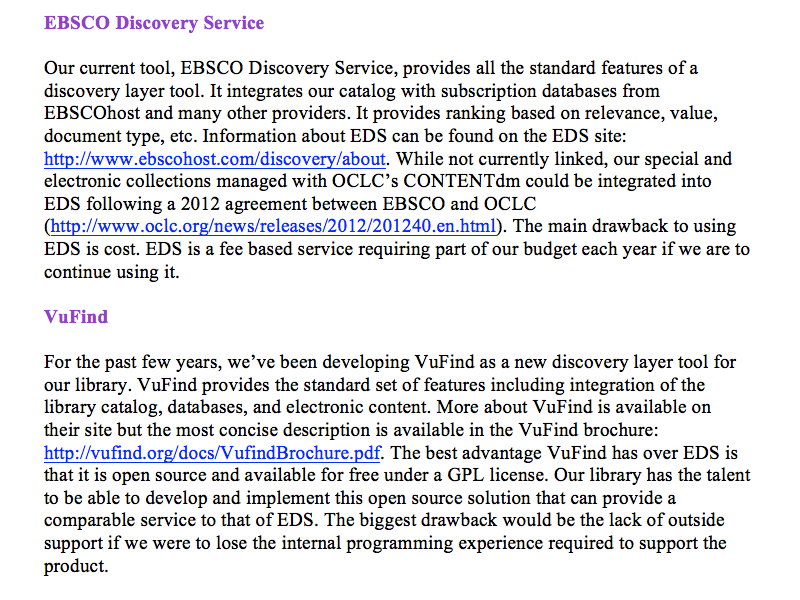 These assignments let me get my feet wet evaluating systems based on the needs of an academic library community. Creating the mobile and discovery layer services memos allowed me to explore the various technologies available for mobile delivery of library services and the different options available for discovery layer services. These are the types of memos that would be required of a systems librarian reviewing the systems in use by their library and recommending a course of action for the future. Writing the memos increased my awareness and knowledge of library systems and their uses and prepared me to communicate my thoughts on different tools to library management. In addition to the tour and memos, the library systems course included a pilot project proposal. This proposal let me develop the basic framework for a project plan including a proposed budget for the implementation of the project. For my pilot project, I chose the introduction of video game systems to an academic library. This project involved researching the topic, gathering data on costs, preparing a budget, and writing up the proposal. I sought out information on how video game systems could further the educational mission of an academic library and gathered evidence showing why this type of system would be useful in an academic setting. 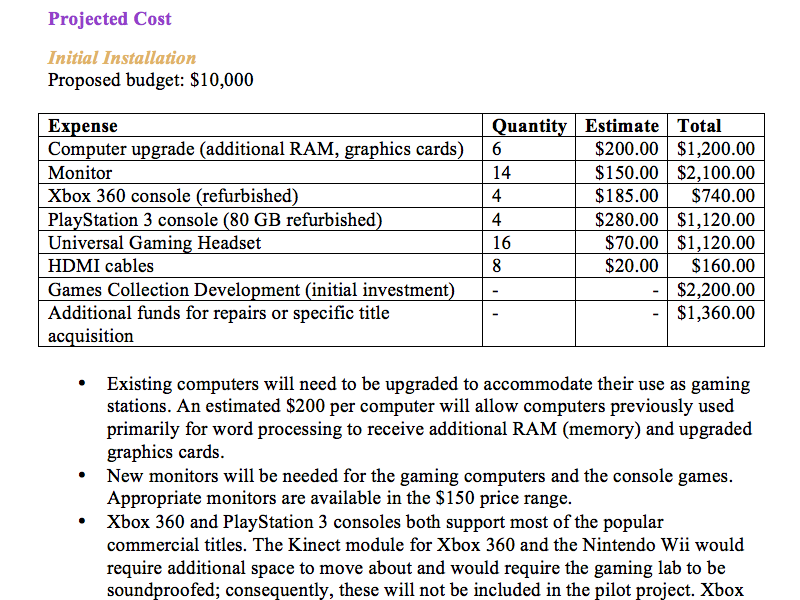 I then evaluated the space and systems available at my role play library and prepared a budget for the purchase or improvement of systems to support the project. This project was great practice for working in a systems role. It allowed me to evaluate current capabilities and determine where changes could be implemented for the benefit of the users. I determined a course of action to propose, developed the steps required, determined a preliminary budget, and proposed steps for evaluation and future development. This was basically preparation for developing a business case to implement a project while in a systems librarian role at an academic library. The library systems course also provided me with my first experience using an integrated library system (ILS). Our class had a mock-library created using Koha. In the ILS, I was given the opportunity to create a new user and check out a book to that user. Since our database had very few books at the time that task was performed, I also had to create a record for the book. Exploring the Koha ILS in this fashion was exiting for me since it was my first chance to truly use the administrative tools within an ILS. Following the experience of setting up a new user and creating an item in the catalog, I also had the opportunity to import a set of MARC records into the Koha ILS. Nearly my entire MLIS experience has been online. Attending school online has provided me with many opportunities to learn new systems and methods of interacting with my cohort and professors. During my program, my school has used two different learning management systems: Catalyst, and Canvas. Each presented different options for organizing course information and collaboration with other students. Some courses were organized in confusing ways making it was difficult to locate information and stay up-to-date on what I should be doing and when I should be doing it. Sometimes the information I needed was locked until a certain date so that I was not able to work at my own pace. Sometimes it was posted in multiple places under different headings. Each challenge has shown me how important it is to maintain information in a single location and link back to it whenever it is relevant. Posting information in multiple locations means that one of them is likely to be out of date. This experience has given me insight into how a user perceives a site and how to make it easier for a user to locate the information they are seeking. Completing my program online has also provided me with opportunities for using online collaboration and presentation tools. My program included many group projects and each of these required some form of distance collaboration with my classmates. For collaboration, I have used Google Drive, Skype, Adobe Connect, Etherpad, email, and built-in tools in Catalyst. Since these group projects often resulted in a group presentation, I've also had experience working with various online presentation tools including VoiceThread, Prezi, YouTube, Camtasia Relay, Tegrity, and Jing/Screencast. Each presentation tool provides basic functionality and makes presenting information to users easy. 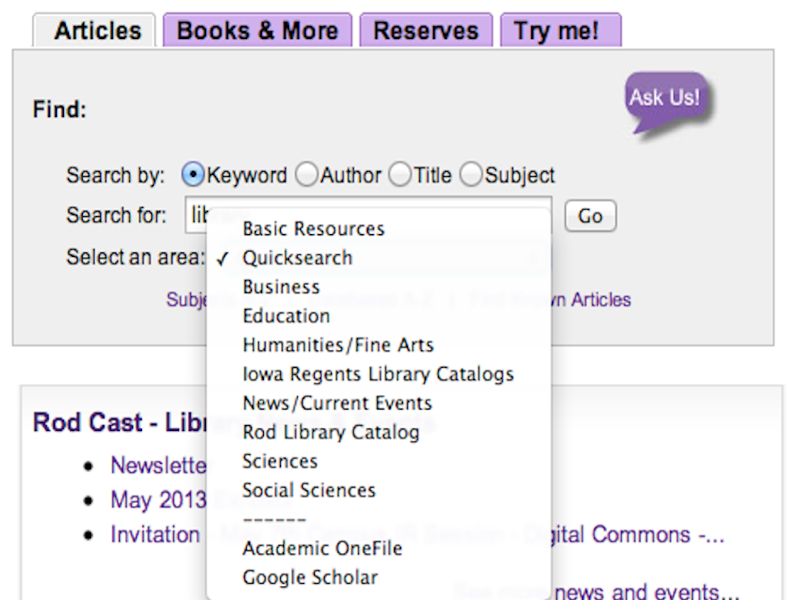 For libraries, any of these tools could potentially increase online outreach to users by making online tutorials and library information more visual.